Mill Creek and Brady Township began their founding some time in the 1770s, as the first settlers began to arrive. Although, a few settlers did live within Brady prior to the 1770s. The earliest families first settled in the area, around the 1770s, were the Eaton, Loudenslager, Pridmore, and Vandevender families. 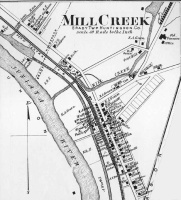 Mill Creek was officially founded in 1848. Reverend Samuel Lane, arriving from Three Springs. was also an earlier settler of the area. He and his family settled on Mill Creek around the year 1790. He spent his life as a missionary for the Baptist Church, travelling on and off road throughout Huntingdon County to preach to and be a minister of families further out in the wilderness of the county. He died around 1812 on his farm in Mill Creek. Mill Creek is a village of two hundred and eighty eight inhabitants, situated at the mouth of Mill Creek and on both sides of that stream. The original plot of the village embraced ten lots, sixty-six by one hundred and fifty-four feet on the north side of the turnpike leading from Huntingdon to Lewistown. It was laid out Oct. 12, 1848 by James Simpson for David Zook & Co., on part of a larger tract of land surveyed June 14, 1786, in pursuance of a warrant granted to Joseph Pridmore March 11, 1786.